ORLANDO, Fla. – October 16, 2018 – The 2019 Florida Cup will deliver a celebration of football across Central Florida from Jan. 8-13, 2019 as it returns to Orlando City Stadium and Al Lang Stadium. Event officials announced today that the 2019 Florida Cup will feature a unique four-team international championship. Tickets to the matches at Orlando City Stadium will be available for purchase starting at 4 p.m. today by visiting www.FloridaCup.com. Orlando City Season Ticket Members can take advantage of a special pre-sale starting at 2 p.m. ET today. Tickets for the match at Al Lang Stadium in St. Petersburg will be available in the coming weeks. 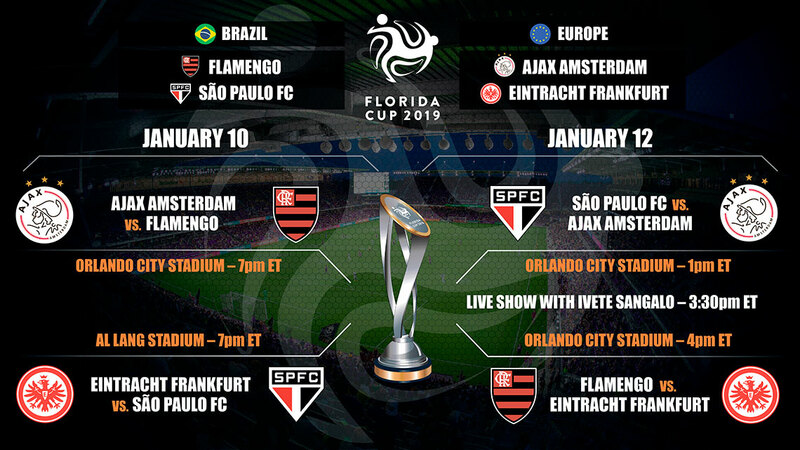 On Jan. 10, Orlando City Stadium will host current UEFA Champions League contender Ajax Amsterdam (The Netherlands) against Flamengo (Brazil) at 7 p.m. ET, while scenic Al Lang Stadium in St. Petersburg will host the Bundesliga’s Eintracht Frankfurt (Germany) against Sao Paulo FC (Brazil) also at 7 p.m. Maintaining the unique international match ups focus, clubs will be separated in two groups: Brazil and Europe. Clubs from each group will face each other in a pair of games and the champion will be determined by aggregate points. Each team will receive three (3) points for a win. Games that end in a tie after regulation will go directly to penalty kicks to determine a winner. A team will receive (1) point for a tie, and one (1) extra point will be awarded to the winner of penalty kicks. The first tiebreaker in the standings, should one be needed, will be number of wins, followed by goal differential, head-to-head result, most goals scored and fair play as defined by FIFA regulations. The Eagles of Eintracht Frankfurt are a founding member of the Bundesliga and are the holding 2018 German Cup Champions after defeating 2018 Bundesliga Champions Bayern Munich. The Europa League qualifying team features seven players who participated in the 2018 FIFA World Cup including Croatian finalist Ante Rebic, Mexican icons Carlos Salcedo and Marco Fabian and Japan’s Makoto Hasebe. Ajax Amsterdam is the most successful club in Netherlands history, with 33 Eredivisie titles and 18 KNVB Cups. As one of the most successful clubs in the world, including the daunting task of achieving the continental treble by winning the Eredivisie, KNVB Cup, and the European Cup in 1972. It also won the first organized UEFA Super Cup in 1972 against Glasgow Rangers (played in 1973). Ajax's raised the 1995 Champions League cup, defeating AC Milan in the final, before nearly repeating in the 1996 Champions League final on penalties to Juventus. One of the biggest, most storied and successful clubs in South America, Flamengo has won one Copa Libertadores, one Copa Intercontinental, six Brazilian Serie A titles and three Brazil Cup championships. As one of the most popular clubs in Brazil with idols such as Zico and Romario amongst its ranks, Flamengo boasts a fan base of more than 40 million supporters around the world. Sao Paulo is historically the most successful Brazilian team, with 12 international titles, 21 state titles, six Brasileirão titles, three Copa Libertadores titles, one Copa Sudamericana, one Supercopa Libertadores, one Copa CONMEBOL, one Copa Masters CONMEBOL, two Recopa Sudamericanas, and three FIFA Club World Cup. Sao Paulo boasts 16 million supporters.